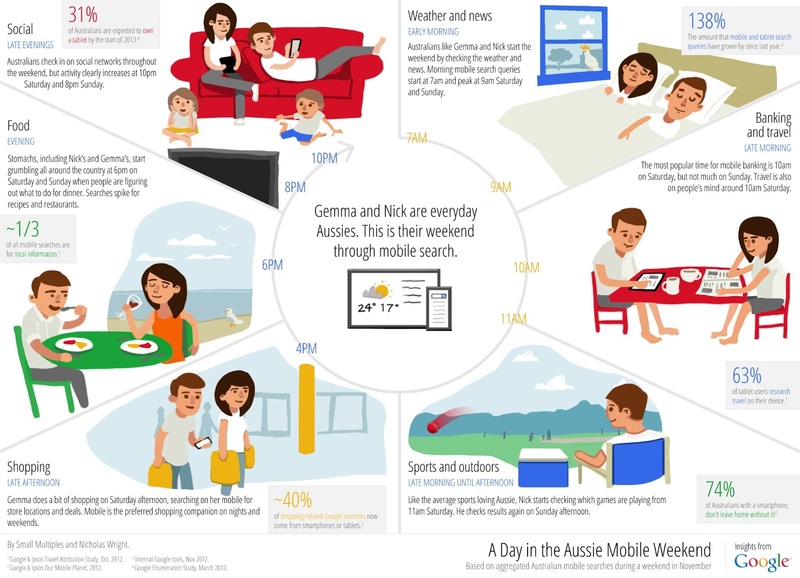 We already knew that Australians are among the most prolific smartphone users in the world, but we wanted to better understand how people are using search on smartphones to make their daily lives easier -- especially as more and more web activity is taking place more and more on-the-go rather than on-the-desktop. So, we took a look at the kinds of things that we’re collectively searching for on our smart phones during a given weekend. The findings paint a really interesting picture of how smartphone search has become embedded into our daily lives. In fact, you start to wonder what we ever did without them! As the infographic below shows, we’re checking the weather on our phones before we’re even out of bed on Saturday morning. Then we get chores out of the way: online banking, and booking travel. Early Saturday afternoons are dedicated to sport on our smartphones just as in our regular lives, and as our stomachs rumble in the evenings, we get out our smartphone to search for restaurants and make bookings. The late afternoon Sunday shopping expedition on foot is preceded by a mobile search spree for hot deals, and there’s a new Sunday night ritual in Australia; checking our social media profiles from the comfort of the sofa or bed. While this research shows what many of us search for on our smartphones throughout a given weekend, it doesn’t capture one of the most fascinating aspects of having the full force of Google search in your pocket all the time - something we affectionately call the ‘pub quiz’ phenomenon and noticed way back in 2009. Even more so than on desktop search, the ‘long tail’ of mobile search queries is extraordinarily diverse, as people whip out their smartphones to settle arguments on the spot, look up the definitions of new words, or (heaven forbid) cheat at the pub quiz. One feature of Google search that you might not know much about is that you can talk naturally into your phone and get a quick answer straight away. For example, if you ask Voice Search something like “do I need an umbrella today?”, the phone will respond to you saying “yes, the forecast for today is 25 degrees, with a chance of storm.” If you’re out and about, using Voice Search will also save you from awkward footpath encounters with fellow pedestrians coming the other way. To get the most out of search and download your smartphone into a 24/7 personal assistant, download the Google search app from Google Play or iTunes.